The Cedar Point Corkscrew is a classic, fun roller coaster with a treasured place in the thrilling history of Cedar Point amusement park. 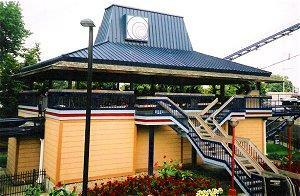 Built by Arrow Dynamics in the bicentennial year 1976, the Corkscrew is the park's third oldest coaster (the Blue Streak and Cedar Creek Mine Ride are older). In deference to the patriotic year, the Corkscrew is decorated in bold primary red, white, and blue colors - the track is blue and white decked out with classic red lights, and the ride's three trains each boast a different patriotic color. Guests can walk beneath the double corkscrew inversion along the midway to admire the ride's grace and beauty, and riders get a special thrill twisting just above the heads of other park guests. While the Corkscrew enjoys a grand patriotic tradition, it also has a greater distinction in the world of roller coaster design and construction: it was the first ride in the world to combine three inversions. The tight vertical loop and twin corkscrew twists helped reinvigorate the inversion craze of roller coasters, and today there are more than 400 roller coasters with at least one inversion, more than a dozen of which also bear the name "Corkscrew." These quick rides were a popular design in the late 1970s and early 1980s, though the simple layout is gradually disappearing today as parks opt for taller, faster, and more modern scream machines. Compared to the park's other 16 roller coasters, the Corkscrew may seem to be a slow, small ride, but it delivers fast-paced thrills. After loading on the sloped station, the trains quickly dip out onto the track before curving around 180 degrees and engaging the lift chain. The brief trip to the top gives riders a pleasant view of Hotel Breakers and the beach to the left and the bulk of the park to the right. The trains carefully tip over the hill - in fact, riders in the front car will seem to dangle several feet past the crest as the rest of the train tops the lift - before swooshing down into a perfectly crafted hill that delivers a surprising amount of negative gravity, pushing riders out of their seats and up against their padded shoulder harnesses. The first inversion is right after the hill - the tight vertical loop that whips riders through a quick 360 degrees before thrusting them onto a gently sloping bridge. There, riders have the chance to catch their breath for just a second as they gather speed and approach the namesake double corkscrew inversions. A quick twist over the midway and riders are suddenly back on a straightaway aiming for the station, with thrills in their hearts and laughter on their lips. The Cedar Point Corkscrew is not for everyone. Riders must be at least 48 inches tall to ride, and guests with heart, back, or neck problems should not ride due to the coaster's quick inversions and sudden changes of direction. Because the coaster uses relatively narrow shoulder harnesses, guests with large chest or shoulder dimensions may not be able to ride or they may find the restraints too uncomfortable for an enjoyable ride. Exceptionally tall guests should opt to ride in the front car (or at least the front seat of any car) for the extra leg room; crossing the ankles can make the seats seem roomier. Riders must step down into the coaster's seats, and this may be difficult for persons of limited mobility. No glass objects, large cameras, or bulky bags can be taken on the ride, though small bags can be placed on the floor of the coaster car while riding (be sure to wrap straps around a foot to secure them). Other items should be left in a locker or with a non-rider for safekeeping. Because the Corkscrew is no longer one of the park's more impressive roller coasters and because it is a quick ride, lines are usually short and swift. Riders may even be able to walk right onto the ride early and late in the day when all lines naturally shorten. The queue area is pleasantly shaded, however, making even a longer wait a great way to anticipate this fun roller coaster. 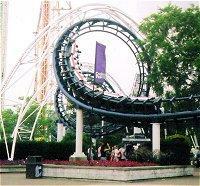 The Cedar Point Corkscrew is a pioneer in many ways: inversions, patriotic appeal, and classic coaster fun, and no visit to this amazing amusement park would be complete without a trip through its three inversions lining the midway.